The holidays naturally mean that there are more opportunities for eating, particularly when it comes to dessert. This is a time of year when people are surrounded by sweet treats given as gifts as well as the ones offered at Christmas parties. That doesn't mean you have to indulge or that you can't enjoy a sweet ending to your meal. There are lots of healthy options that allow you to enjoy dessert without ruining your health goals. A frozen fruit pop is easy to make and you can customize it for a Christmas-worthy dessert that won't leave you feeling deprived. Try cranberries for a festive flavor, or use any fruits that are in season and easy to find. Place the ingredients in the blender. Start with only half the milk and yogurt and add more as needed to create the consistency you want. 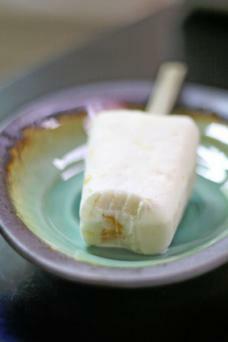 Pour the mixture into frozen pop molds. Freeze until solid, about 2 to 3 hours. Not only is this dessert tasty, but it takes a few minutes to eat, which keeps you from reaching for other desserts before they're cleared away. Since it's Christmas, serving a holiday-themed dessert is fun. 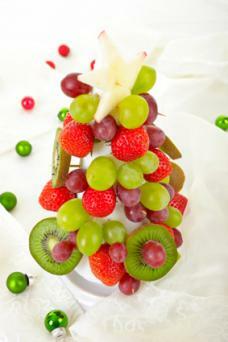 Choose a healthy option with a fruit Christmas tree. This dessert is great for parties and other events that draw a crowd. Arrange the kiwis on a large platter in the shape of a Christmas tree. Cut the kiwi slices in half, if needed. Scatter the berries and grapes over the kiwis to make ornaments. You can also cut starts or other shapes from melon to add to the tree. Nibble on this tray before a meal to fill up your belly a bit and keep from eating too much when the main course comes out. Cinnamon is a classic Christmas spice and can bring up your favorite memories of the season with just one bite. It shows up in pie and other holiday desserts that you might want to avoid this year. To keep with the flavors of the season, try baked apples. 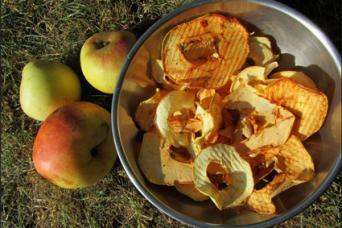 Arrange the apple slices on a large baking sheet and sprinkle them with cinnamon and sugar. Bake the slices until crispy, about 30 to 45 minutes. You can also add other spices, such as nutmeg or cloves, to give your apples a delicious holiday flair. Use whatever color you like or mix red and green ones for a festive color palette. Everyone loves a banana split and it doesn't have to the fat and calorie bomb that many Christmas desserts are. A banana has plenty of nutrients and can satisfy a sweet craving. Place two half banana slices in each of 4 dishes. Top the bananas with even amounts of cinnamon or peppermint ice cream. Finish it off with just a dab of whipped cream and a sprinkling of cinnamon. This is a fun dessert for kids because they can easily customize it just the way they want it. Chopped nuts and dried fruits are other healthy additions to a banana split. Bark is a classic Christmas dessert and it's easy to make and even easier to customize to your healthy standards. The best part is that no one will know the difference because it stills tastes heavenly, even if it isn't loaded with candy, marshmallows or other junk food. Melt the dark chocolate in a double boiler or the microwave. Line a large baking sheet or casserole dish with waxed paper. Spread the chocolate on it. Embellish the bark with healthy sweet treats. 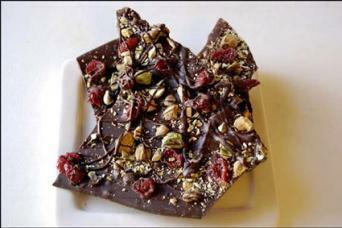 Chocolate bark is the perfect gift to give teachers, coaches and co-workers for Christmas. They will each love that you made it a bit healthy so they can indulge without as much guilt. This idea is the perfect way to end a Christmas meal, but also makes a healthy holiday breakfast idea. A parfait can be completely indulgent, but doesn't have to derail all of your eating habits. Divide the yogurt among four dishes. 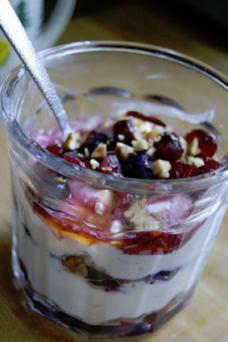 Scatter the cranberries and nuts in equal amounts on the yogurt. Cranberries and walnuts are the perfect combination for Christmas, but go ahead and mix and match your favorites to create a yummy treat all through the season. Pears are in season during the Christmas months and often show up on holiday appetizer platters. You can also enjoy them for a sweet dessert. 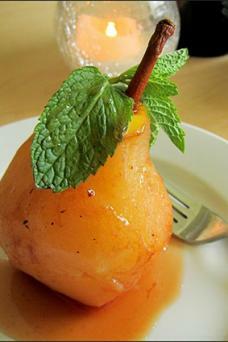 Poaching the pears allows you to give them a holiday flavor with very little effort. Bring the wine, port or cider to a boil over medium-high heat. Place the pears in the liquid, reduce the heat to low and simmer for about 30 minutes. Add water as needed to keep the pears almost fully submerged. Return the liquid to a boil and reduce it until thick. Drizzle the liquid over the pears before serving. This dessert is fancy and makes for a very elegant presentation on your Christmas dinner table. If you plan to serve this dish to kids, consider sticking to the cider. The alcohol will cook off, but kids might not like the taste. Temptation is everywhere during Christmas, which makes it very hard to make healthy eating choices during the holidays. The American Dietetic Association offers some tips to make things easier for you. Don't attempt to lose weight during the holidays, but aim to eat to prevent weight gain. Eat your dessert from a small dish so you feel like you are getting a healthy portion, while also enjoying a sweet treat. Eat just a small bit of indulgent desserts, then round out your meal with something healthier. Look at all the dessert offerings before making a choice, which lets you choose the best one for your goals. Christmas doesn't have to leave you with lingering guilt and pounds when it's all over. It's hard to avoid eating all the delicious desserts that are abundant during the holidays. Enjoy some healthy ones so you have a memorable holiday without all the added weight.